I just read a really good book, y'all — 15 Minutes by Larissa Reinhart. Let me tell you a little about this humorous cozy mystery. Maizie Albright has just returned to Black Pine, Georgia, the small town she lived in as a child (after being ordered by a California judge to finish her Criminal Justice degree, leave Hollywood and showbiz, and get a job in Georgia within 10 days of her arrival). In Hollywood, Maizie was a celebrity, a teen star on Julia Pinkerton, Teen Detective. She began acting in commercials, and landed her first big role (Kung Fu Kate) at age 9. In Black Pine, 25-year-old Maizie has to make a few adjustments for a life out of the spotlight. but when Maizie's funding went away, so did her "friends." In Black Pine, after a bit of a rocky start, Maizie makes two true friends in Tiffany and Rhonda. I enjoyed reading about how the three of them help each other out. "I'm Maizie Albright. I mean, Maizie Spayberry. Well, it was Spayberry, and I'm thinking about switching back permanently. Although I do like my other name. It has a better ring, which is why my manager changed it." "Here's an investigator training tip. It's a little hard to do undercover surveillance when the investigator is front page news." "You're not any good without a vehicle," said Nash. "Get your act together and come back tomorrow." Maizie turns to her father, Boomer Spayberry, for help. "But Daddy, how can I persist and work my tail off without a car?" "I bought you a vehicle for your fourteenth birthday. It's still in the barn where you left it." "What vehicle?" My face squinched and I almost forgot to smooth out the wrinkles. "The dirt bike? I can't ride a dirt bike around town." "How do I ride a dirt bike in a dress?" "You don't. You need to stop dressing so fancy, anyhow. ..."
15 Minutes abounds with humorous moments, in addition to those with Maizie running surveillance on "Lucky," her dirt bike. Maizie often tries to resolve sticky situations by asking herself, "What would Julia (or Kate) do?" Since Julia and Kate would rely on their stunt doubles, their solutions don't really help Maizie much. She is successful, using some remembered dialogue and muscle memory. The action in the climax is so exciting! I can assure you, you'll never think about jeans, thongs, and flare guns the same way, after reading 15 Minutes. 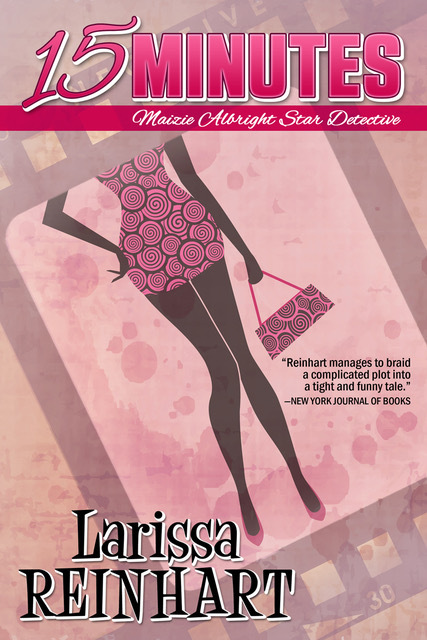 I can't wait to read the next book in the Maizie Albright Star Detective series, 16 Millimeters, coming in 2017! I recommend 15 Minutes to all fans of cozy mysteries, especially to those partial to mysteries with Southern settings. I think it will have special appeal to readers who are fans of child actors, teen detectives, reality shows, and Author Larissa Reinhart's Cherry Tucker Mystery series. 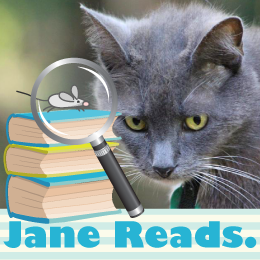 I really enjoyed 15 Minutes by Larissa Reinhart, and grant it Four Kitties! Note: I voluntarily reviewed an Advance Reader Copy of 15 Minutes. I love Georgia. Right now I’m living in Japan for the fourth time but I’ve always got Georgia on my mind. My first Cherry Tucker book, Portrait of a Dead Guy, was written in Japan partly because I was homesick for Georgia. My second series, Maizie Albright Star Detective, is also set in Georgia, this time in the North Georgia Mountains at a lake resort. In 15 Minutes, Black Pine is fictional. So is this story about the founding of the town. Black Pine, the city, edged along Black Pine, the lake, which bordered Black Pine, the mountain. This lack of creativity in the name department occurred when rich carpetbaggers and Georgians of the Gilded Age decided to escape the summer heat in the North Georgia mountains and parked a golf resort at the base of Black Pine Mountain. In the 1930s, their children convinced the federal government to spend WPA money on Black Pine. The PWA dammed off a river, creating Black Pine Lake, thereby expanding Black Pine Resort into a yacht club. Now besides rich Georgians, rich Californians resort at Black Pine, playing golf and tennis, yachting, and boozing at the Cove bar and restaurant. I’m sure that’s exactly what Roosevelt had in mind for the New Deal. 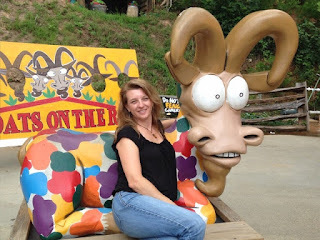 The North Georgia Mountains are a favorite getaway for Georgians, Atlantans in particular, and a favorite escape for my family (we lived south of Atlanta, near Cherry Tucker’s fictional hometown of Halo). You can find resort towns along Georgia’s northern border although maybe not with quite the panache that Black Pine carries. If you continue to drive north on I-85 to I-26, it won’t take you long to reach Asheville, the North Carolina mountain city outside of which George Vanderbilt II settled and built the Gilded Age masterpiece, the Biltmore Estate. I love the culture of these mountains. It’s varied. There’s culture connected to the first American Gold Rush; rich American Indian history like the Cherokee Nation capital, New Echota; there’s Appalachian culture still recorded at the Foxfire Museum in Mountain City; and then you have the kitschy, party atmosphere of the Bavarian-styled town of Helen. Besides mountains there are beautiful lakes and rivers and gorgeous natural scenery in every direction, not to mention all the apple orchards and wineries in between. 1) Anna Ruby Falls is inside Unicoi State Park, just outside Helen, Georgia, and part of the Chattahoochee State Forest. Anna Ruby is a double waterfall with a beautiful (paved, fairly easy) hike to the base. I love the story behind the falls named for Anna Ruby Nichols, the daughter of a Civil War Colonel, Captain J. H. Nichols. After the death of his wife and child, Nichols found the double waterfall while riding on horseback through the mountain property he purchased after the war and named it for his surviving daughter. On a side note, Nichols also found four Nacoochee Indian Mounds, contributing to the history of the area. One grave was made from stone found in Lake Superior. 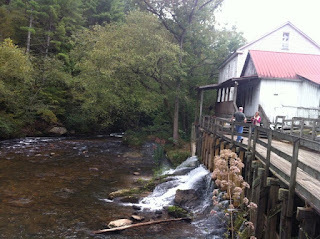 2) Apple Alley, the ten mile stretch of Georgia Highway 52 east of Ellijay. 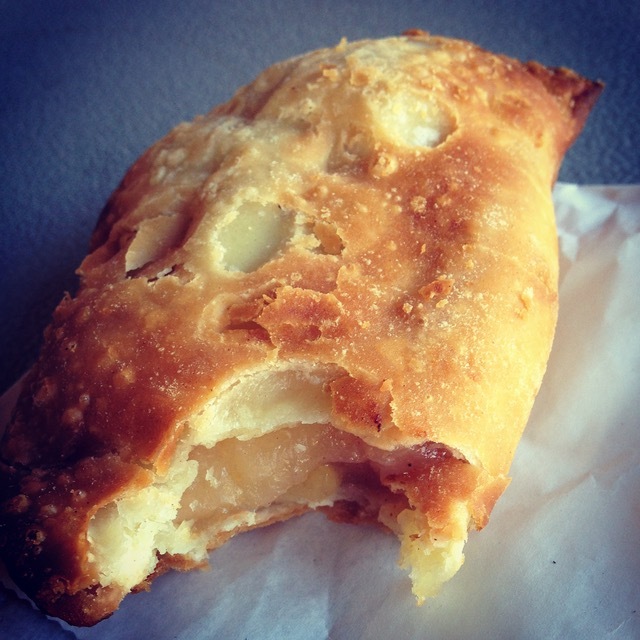 You MUST try a fried apple pie. Preferably from a rickety roadside stand. The sketchier-looking the stand, the better the tasting pie. 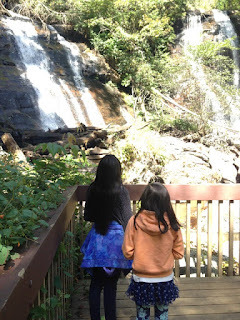 3) Amicalola State Falls Park. I already listed a waterfall, but Amicalola is stupendous and the park is gorgeous. You can hike up a wooden staircase to the top of the fall, but it’s not easy. I like to drive up, stay at the lodge, and walk part-way down. If you’re a real hiker, you can stay at Len Foote Hike Inn, which requires hiking 5 miles further. I’m not a real hiker, but I’ve camped in Amicalola Park as well as stayed at the lodge. 4) There are a lot of lovely mountain towns, but my family is partial to Dahlonega. Once the center of the 1840s gold rush, there’s a nice gold museum, mine tours, and tons of “mine your own gold and gem” places all over the area. It’s also a beautiful historic town in its own right, home to North Georgia College. Dahlonega hosts tons of festivals, art galleries, wineries, and live music. It’s also a great jumping off point to hit other towns and parks in the mountains. 5) Tallulah Gorge was made famous when the Wallenda Brothers tightrope-walked across the canyon, but even before that, it was a Victorian-era resort town. The gorge is now a state park with five waterfalls, suspension bridge, trails, and the Tallulah River winding through it. We like the view from the Tallulah Gorge Scenic Loop “overlook porch” because that’s where Overlook BBQ is located. Please try the BBQ cup with layered pulled pork, cabbage slaw, and purple hull peas. My husband calls it “heaven in a cup.” Also nearby in Tiger is Goats on the Roof. Always a crowd pleaser. We hope you enjoy the North Georgia Mountains as much we do! Her family and Cairn Terrier, Biscuit, live in Nagoya, Japan, but they still call Georgia home. You can see them on HGTV’s House Hunters International “Living for the Weekend in Nagoya” episode. 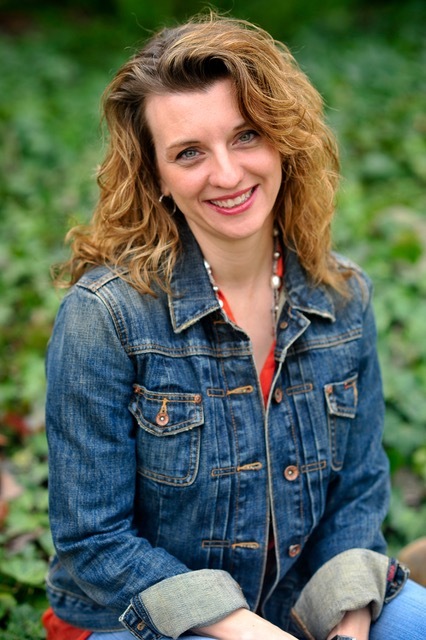 Visit her website, find her chatting on Facebook, Instagram, and Goodreads, and sign up for her newsletter here.